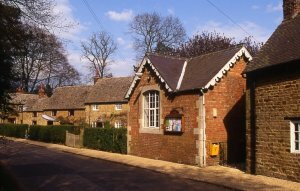 Thorpe Mandeville Village Hall is in the centre of the village, Banbury Lane, Thorpe Mandeville , Banbury, OX17 2EY. Street parking is available outside the hall. A map showing the location of the hall can be found on the Contact Us page of this website. 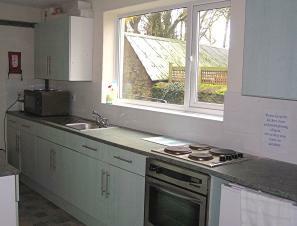 The hall is a multi-purpose facility available for hire having a kitchen, disabled access and disabled toilet facilities. 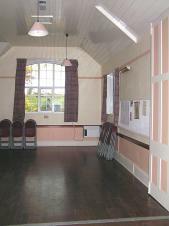 The village hall is a registered charity "for the village," entirely independent of the Parish Council, operated by a committee of volunteers. All running costs have to be met from hall hire, fundraising events and donations. 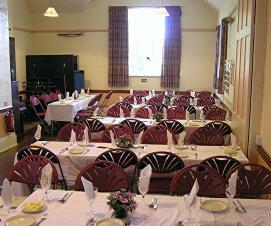 The hall can be hired for events such as family parties, meetings, dinners and fairs. Contact for bookings: Village Hall secretary, Emma Bond, Tel: 01295 711090 or other committee members. Charges are negotiable for regular users. Hiring time includes "setting up" time. Hire of equipment is available on request. Below: The hall arranged for a dinner.